Giovanni’s Island is a tale of family, unlikely friendship, and growing up in the days after the end of the Second World War. It is also, as you might expect, a film as tragically depressing as it is excellent. Days after the end of World War II, the Soviet army invaded the Kuril Islands, a chain of islands that stretches from Russia to Japan, that were full of Japanese inhabitants. Giovanni’s Island is the story of the occupation, deportation, and other trials the inhabitants went through before returning to Japan proper as seen through the eyes of two young brothers, Giovanni and Campanella. This point of view is particularly striking and shows a unique perspective of the events. As the adults plot and plan, the children simply struggle with coming to terms with the new inhabitants of their island and what it means for their lives. Their once large house is now split in two (with one half now belonging to the Russian commander), and Giovanni’s family of five is forced to stable their horse inside the now cramped building as well. But, as children do, they become accustomed to their new circumstances and even make friends with the Russian children that now make up half the school. Unfortunately, the children soon find their world turned upside down again as the whole village is deported to a Russian internment camp, and the boys must learn to deal with the effects of sickness and starvation among their ever-dwindling family. It is a great, heartbreaking tale of innocence encountering the harsh events of the real world. The first half of the movie follows the brother’s time in their occupied home town—particularly Giovanni’s friendship with Tanya, the daughter of the Russian commander. Despite the language barrier and cultural differences, Giovanni and Tanya forge a bond thanks to their shared love of trains and the classic Japanese novel Night on the Galactic Railway. Tanya is particularly interesting as she finds herself halfway across the world surrounded by a culture unknown to her. She humanizes the Russians and makes them seem like people rather than an evil faceless mass—for the audience as well as Giovanni himself, even as he enters an internment camp in the later half of the film. There are no “bad guys” in this film. The closest the film has to one are the soldiers who burst into Giovanni’s class at the beginning of the film and order the children outside at gun point—an order neither the children nor teacher can understand and therefore can’t follow. While this is a film that could be full of tales of conflict and oppression, it is more one of normal people doing their best in abnormal circumstances—on both sides. The elementary school becomes home to both Russian and Japanese students. Tanya’s father encourages Tanya’s friendship with Giovanni and invites the brothers over for dinner and dancing. Even in the second half of the film, Japanese and Russians alike remain strikingly reasonable. At one point, the brothers are caught right outside a heavily fortified labor camp. But rather than any kind of life-threatening punishment, they are taken in, warmed up, and then given a ride back to their internment camp. After all, they are just children. It is refreshing that no one is demonized in this film, yet, at the same time, it makes the film all the more tragic with no one to hate for the brothers’ plight. With invasion and internment camps, it should be obvious that this is a tragic tale ripped straight from the pages of history. However, it is also a movie and thus follows many of the clichés you’d expect in such a film. Five minutes into the film, it’s already obvious that several characters will not be making it through the movie—as their deaths would be the most depressing ones possible. So while the film generally hits all the correct emotional notes, the predictability of certain characters’ impending doom somewhat dulls the emotional effect their death scenes should have. Giovanni’s Island is a heartbreaking tale of what happens to normal people after a war is over. It explores friendship, diversity, and the innocence of children, and still never makes anyone “evil” despite the nature of the setting. And while I didn’t really get into it in the review proper, the hand-drawn animation is downright beautiful. 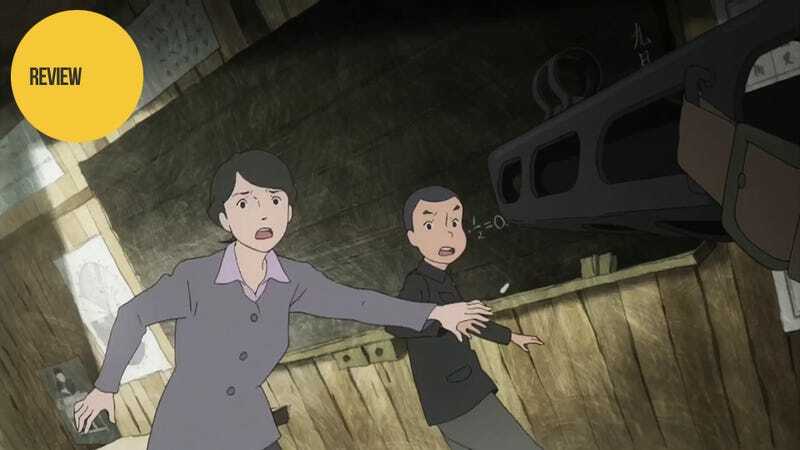 If you are a fan of films like Barefoot Gen or Grave of the Fireflies—or historical drama—you should definitely give Giovanni’s Island a watch. Giovanni’s Island was released in Japanese theaters on February 22, 2014. The film will see its first Western release on March 22, 2014, at The New York International Children's Film Festival.